If you are planning the romantic, beachside wedding of your dreams then this list of wedding venues in Byron Bay is just for you. If there is one thing they do well in Byron Bay, it is the perfect wedding. Actually, as a sublime and serene holiday destination, they do quite a few things well in Byron Bay, but their ability to host an awesome wedding is our favourite. If you are planning the romantic, beach-side wedding of your dreams then this is the place for you. Filled with wonderful cafes, restaurants, shops and accommodation, not to mention the crystal beaches, your family and friends will have an incredible time at your Byron bay wedding. They will never want to leave. The Belongil is a trendy light-filled space with a relaxed atmosphere and just wonderful food. It is the ideal venue for a modern and fun couple who want to treat their guests to a delightful day. Belongil Beach is known for its tranquil, natural landscape and spectacular sunsets. This versatile space can be transformed to suit many wedding themes, and the staff are poised to give your guests their attentive, detail-filled service. And have we mentioned the food?? Tucked away in the Byron Bay hinterland is a divine secret retreat called Earth House. For natural, rustic elegance and a glorious, happy wedding day, this is your venue of choice. The views across the mountains to the bay are breathtaking and will serve as a dreamlike backdrop to your big day. Take a wander through the photo gallery from this wedding venue in Byron Bay for inspiration and flutters of excitement about how beautiful your wedding could be. Something Byron is famous for, aside from the chilled-out celebrity sightings, are the centuries-old fig trees. One such example sits majestically above this lovely restaurant and gives the venue its name. It will also look incredible in your wedding album, providing the ideal amount of dappled shade for your reception celebration. The restaurant is established in the original farmhouse on the site and overlooks Byron Bay. Famed for their use of seasonal local produce, gourmet foodie couples will love this spot. You can’t get more ‘wedding’ than a stunningly outfitted old church, right? Nestled away in the heart of nature, this wedding venue has it all. A beautiful gothic style old church building which has been recently completely transformed, it is surrounded by 17 acres of gardens and rural landscapes. This is a DIY venue, so you bring in caterers, florists and anything else you desire, but this venue has passionate events people to help you plan and execute everything perfectly. A unique and romantic oasis of calm; the best possible spot to start married life! 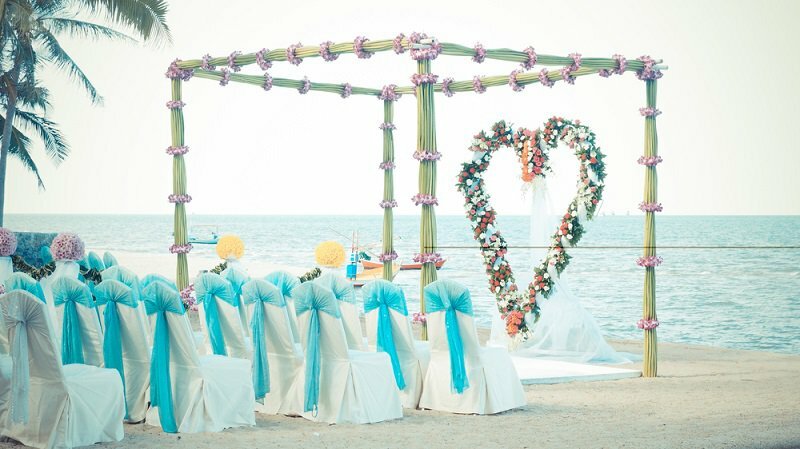 Beach Restaurant is an impeccable choice for your wedding day. Renowned for service and food, the couples who have tied the knot here rave about their experience. When you want hospitality that covers everything, inspiration and guidance with your wedding planning and décor, and a stress-free day, this is the venue for you. Catering for up to 150 guests and offering a range of indoor and outdoor options for your ceremony and reception, this place is simply beautiful. This wedding venue is what Byron Bay weddings are all about! When you are looking for the chilled cool vibe of a wedding on the sand, but still with the luxury and service of a high-quality entertainment host, this should be your choice. A pristine and sophisticated space with a contemporary Balinese atmosphere – this Byron Bay wedding venue has really captured what makes the perfect romantic day. With opulent accommodations for the bridal party and the ability to host an intimate celebration of up to 70, this boutique space is a must-see. This is a stunning modern bed and breakfast hidden by nature and surrounded by ancient fig trees. The venue is exclusively yours for your wedding, including accommodation for up to 14 people to help you fully relax and prepare before and rejuvenate after. 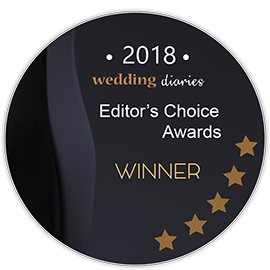 Winning awards for their hospitality, The Figs have a range of ceremony and reception spaces and can cater to up to 120 guests. You can bring your own drinks, and arrange catering to come on site, but the management have partnerships with some of Byron’s premier caterers and can help you plan this. Known as the French House, here you can celebrate your wedding in a home where European history and style unite. Hidden away on a quiet country lane and surrounded by lush rainforest. It has stunning views across orchards, grand old native trees and manicured gardens. The French farmhouse-inspired homestead offers many superbly decorated spaces for your ceremony, reception and photos. Exquisite and meticulously decorated to reflect timeless elegance, this venue has everything for your wedding celebration, including stunning accommodation. For a luscious long luxurious destination wedding, you will fall in love with Deux Belettes. This 100-acre property has the magical ability to host large scale celebrations yet still seem exclusive and intimate. For rustic elegance you can erect a tipi and gaze across the lake, rolling hills, and friendly farm animals. Search for the secret waterfall, and then watch the sunset and kiss the love of your life under a billion stars. With on site accommodation and catering packages from some of the region’s best chefs, your every heart’s desire will be brought to life here. In the heart of Byron Bay and with views across the main beach, you can’t get much closer to the action than this. This flexible space can be set up to host all kinds of weddings, from formal sit-down dinners to casual cocktail parties and everything in between. Through local planning extraordinaire,Byron Bay Weddings, catering can be arranged with some of the best providers in the region. What won’t change is the world class service and chilled atmosphere, and of course those breathtaking views. For large open beachfront space and a mesmerising ocean outlook, this is the spot for you. Style your own rustic country style wedding at this beautiful barn, marquee, and outdoor space.Jaw dropping views across the valley and mountains offer a romantic backdrop with a touch of drama for your big day. This venue is a DIY dream, with your choice of a medley of options for furniture for both the ceremony and reception, arbour, lighting for the pavilion area and accessories. Of all the venues we looked at, the barn has the largest selection of choices for set up by far. Hire off site caterers, bar staff, florals and styling to perfectly align with your vision.The charming cabins and main house sleep 14 guests, with additional cabins and room for camping available if required. This exclusive site offers the perfect atmosphere for a relaxed wedding for up to 100 guests. Romantic, intimate, breathtaking – these are the words that instantly come to mind when browsing through the photos of this countryside paradise. Perfect for weddings or elopements, exchange vows in this surreal setting hidden away in the hills at the highest property in the Byron Shire. If excellent cuisine is your top priority, rest assured that venue management have taken great care to ensure guests are fed well by teaming up with two of the town’s most sought after caterers, Fig Tree Catering and Feast Events.Both companies offer handmade cocktails and beautifully curated menus that use the freshest local ingredients available to make delicious and mind blowing creations. Boasting sweeping ocean to mountain views, this 100 year old estate offers an effortlessly perfect setting for photos. The secluded setting is perfect for intimate gatherings but can accommodate up to 120 guests for larger parties. This rustic dream nestled among beautiful gardens is perfect for couples looking to build their own vision. As a BYOB venue, it’s also a great option for brides looking to host an open bar at an affordable rate, and you’ll also have different caterers and coordinators to choose from to customize your big day. This beautiful space has capacity for 100 guests, and onsite accommodation in their farmhouse, perfect for getting ready before your wedding and for the night afterwards. Travel back in time through a canopy of huge Moreton Bay fig trees and arrive at the historic Ewingsdale Hall and church where you’ll feel pulled into a scene from Gone With the Wind. Looking for something that offers a traditional vibe? Ewingsdale Hall offers an onsite chapel for exchanging your vows. The historic hall, built in 1908, has been impeccably maintained and can hold up to 120 guests, or you can contact the venue about hosting up to 150 guests with use of the exterior. This is a venue for hire only, and perfect for couples looking to customise their day with their own vendors and styling. The Point’s first and most enviable selling point is its extravagant view. This hilltop space boasts panoramic views of the entire shire, stretches of lush forest and the ocean beyond the eye can see. At magic hour, you’ll think you’ve found the edge of heaven. They offer a blank canvas for you to design to your personal tastes, or to take advantage of its natural beauty. A perfect space for the ceremony, photos and a few cocktails, the Point hosts guests until 7:00 p.m. or last light. If you’d like to keep the party going, they have a variety of partners to choose from for an extended reception. Like many venues in the hills, this ethereal hinterland boasts incredible views perfect for setting a surreal scene to exchange your vows. A peaceful, private estate located just minutes from Byron Bay’s beaches, this is another of the town’s blank slate spaces. With exclusive access to the property, you won’t have to worry about running into other wedding parties. This stunning venue boasts 50 acres of grasslands, natural waterways and forest that run along Belongil Beach. 192 free standing villas offer plenty of accommodation for your guests and create a sense that you’re getting wed in your own little village. You have an impressive array of options for a classic Australian reception right near the beach. Host an exclusive gathering in their more intimate dining room or choose from a variety of indoor and outdoor spaces to host a dinner for up to 250, or as many as 3000 for cocktails. It truly is yours to create your dream wedding! Looking for luxury? Look no further than the Byron at Byron Resort & Spa. Hidden among 45 acres of lush rainforest, you’ll be surrounded by luscious greenery and stunning florals in this relaxing, upscale spot. With 5 different venues to choose from, this space is perfect for all party sizes, up to 130 guests for a dinner and dance (180 for cocktails). Just 5 minutes from Byron Bay town centre, they offer 92 rooms for guests coming in from out of town or looking for some extra pampering with their many spa packages. This space is also a rare gem that offers hair and makeup right on site! With lush greenery covering impressive mountainous terrain, this ocean side shire offers the best of what the sub tropics have to offer. The laid back, boho vibe of the little town has inspired some truly eclectic and unique spaces, but if you’re looking for something higher class or more luxurious there is no shortage of options of either ready-made or self-designed spaces. As a resort town, it’s also the perfect spot for a destination wedding. Guests can stay on site at many of these spaces, or around the many accommodations in this beautiful little town. The famously friendly locals will welcome them into their charming home. With no shortage of boutique shops and artisanal food, your guests will not be disappointed to spend a few days with you here! As one of the loveliest coastal towns in New South Wales and Australia, Byron Bay offers many gorgeous waterfront and beach wedding ceremony and reception venues. Also, there are adorable waterfront villages, beautiful tropical flora, great seafood, and great surfing opportunities (great for the athletic couples and for the families on your guest list). The area is known for its laid-back, bohemian attitude and vibe, but it’s also great for elegant, classy weddings! Don’t miss out on Cape Byron State Conservation Park and the Lighthouse, as well as the many beautiful, spotless beaches! There is quite a variety of wedding ceremony and reception venues available in the Byron Bay area, ranging from $2,500 – $12,000 (price may not including catering fees, decoration fees, wedding planning and coordination fees, etc.). Most of the wedding venues in this region will be in the form of beach or waterfront weddings, estates, gardens, historic, and country, and most offer fantastic views of the ocean and hinterlands. As always, we suggest making sure to include taxes, gratuities, and extra / hidden fees into your wedding venue budget. There are some smaller airports in the Byron Bay area, including the Ballina Byron Gateway airport, which offers local and domestic flights. We would suggest recommending your guests, especially those who are arriving from out-of-state or from international locations, to fly into either the Brisbane Airport or the Gold Coast airport, both larger and international hubs. It takes approximately an hour and fifteen minutes to drive from the Gold Coast to Byron Bay, and two hours to drive down from Brisbane. Both the drives are lovely, with scenic views of the waters. There are many great hotels in the Byron Bay area available for both you and your guests, ranging from approximately $40 – $320 per night. Generally, the closer the hotel is to the waterfront and to Cape Byron, the more expensive. We love the Cape Beach House ($177 per night) and Outrigger Bay Apartments. There are also Airbnb’s available in the area, starting from $20 per night. Byron Bay, New South Wales, is quite warm throughout the year, but the warmest months (and the most popular for wedding ceremonies and receptions) are November to March. It can get quite warm in these summer months, with average high temperature of 28oC in January—so you may wish to look for venues with air conditioning, or outdoor marquees with fans! The cooler months are through June to August, but the lowest expected temperatures during this month does not dip below an average of 12oC. Byron Bay also experiences quite a bit of rain, with the most rainfall occurring in the summer months, from December to April, with an average of approximately 10 days of rain each month. We strongly suggest asking your wedding venue if they have a back-up / plan B for inclement weather, especially for outdoor wedding ceremonies and receptions—although a little bit of rain, with some cute umbrellas, would make for some adorable wedding photos!